The last time I bought a couch, I looked at more than 4000 before finally settling. Then I had to figure out if it would fit through my door. Like Casper, Burrow ships in boxes, and even vacuum packs its cushions in a similar way. Assembly is tool-free and ridiculously easy. In fact, because the .pdf instruction manual went to the email address of the previous incarnation of our company, I had to assemble mine through intuition. Burrow is also always ready for tool-free disassembly when you’re ready to move, and modular, so you can add more seats later. Pricing starts at $750 for a two seater, which is very reasonable- pricing on IKEA sofas starts around $400 at the time of this writing. Burrow isn’t a revolution in terms of materials or aesthetics. It looks great and is deep enough and soft enough to be quite comfortable, but for better or worse, no one is going to know your couch is “disruptive” unless you tell them. 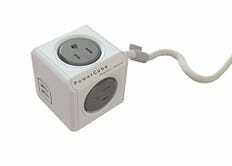 Another thing you’ll find under Burrow’s cushions is a mounting point for a PowerCube (included), which will keep you from having to move the couch when you want to plug in a new lamp or charge your phone. It’s a great feature that would be even better with a flat wall plug. The couch is also high enough off the floor for your robot vacuum to easily navigate under. 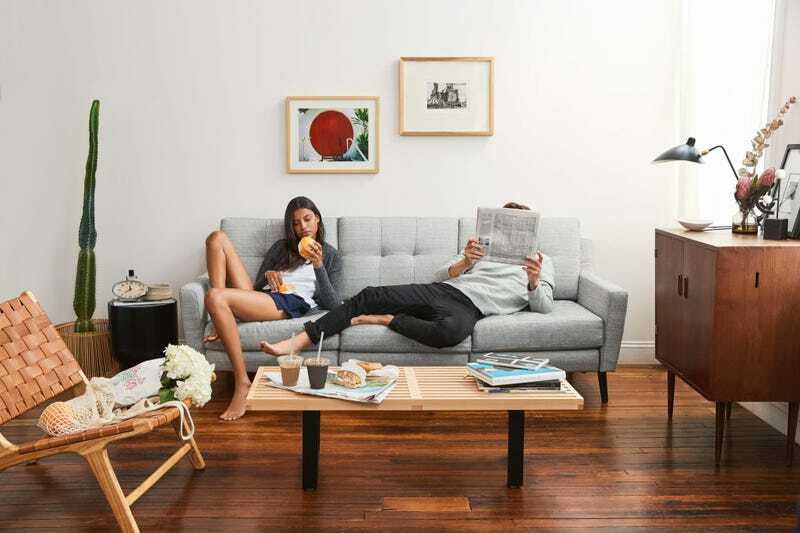 If you’re in need of a new couch, Burrow’s easy assembly, stain resistance, USB integration, and pricing make it an easy recommendation, especially if you live in a walk-up or have a small front door. Update 11/7/17: Burrow has launched their long-awaited chaise and ottoman options for their couches, and we tested a four-seater Burrow with a chaise and ottoman alongside my old two. Burrow moved their manufacturing to the US, and as such their fabrics have changed. The new gray won’t exactly match your old gray, but you can reach out to Burrow to get the new additions to the line to match your old fabrics. Since we last checked in, their couches are now available with high or low arms, the high being much more comfortable and the low looking a lot better. We also noticed anecdotally that the clamps that hold the couch together are much easier to close now, and not so anecdotally that the spikes that hold the couch together are now shorter and rounded, making them far less dangerous. Burrow made some interesting choices with the chaise. It can go on either side of your couch, which is great, but both sides of the pillow are untufted. If you’ve gone with the tufted sides of Burrow’s reversible pillows for the rest of your setup, you’ll need to flip them all to untufted, or have a tufted couch with a untufted chaise. While it surprisingly hasn’t been a problem, there’s also no connection point between the chaise or ottoman and the couch. The chaise pillow holds its base in place by virtue of weight and friction, and the ottoman is just floating. We’re still big fans of Burrow’s couches, which feel airy and minimalist compared to much of what’s on the market. The chaise and ottoman additions are comfortable and easy to shift around the room, pricing gets more palatable the more seats you get, and everything comes with a 30-day trial.